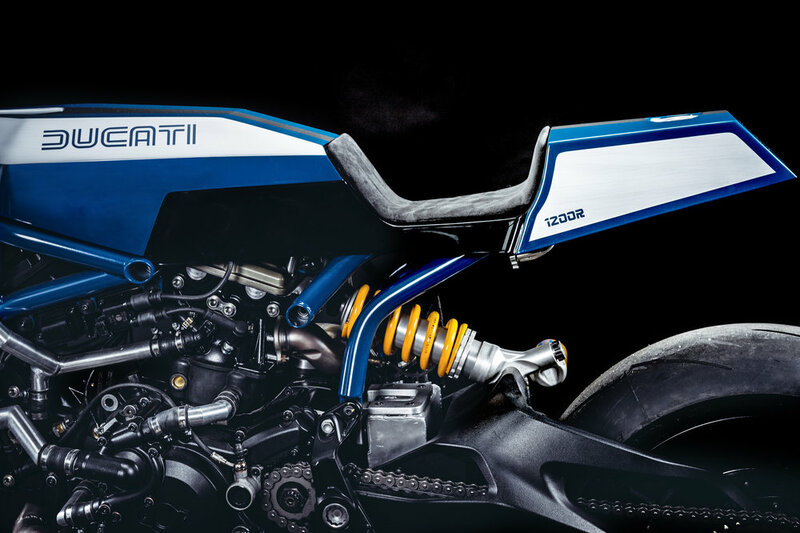 When we got the honor to do a design study for Ducati based on one of their latest racer we did not have to think twice. 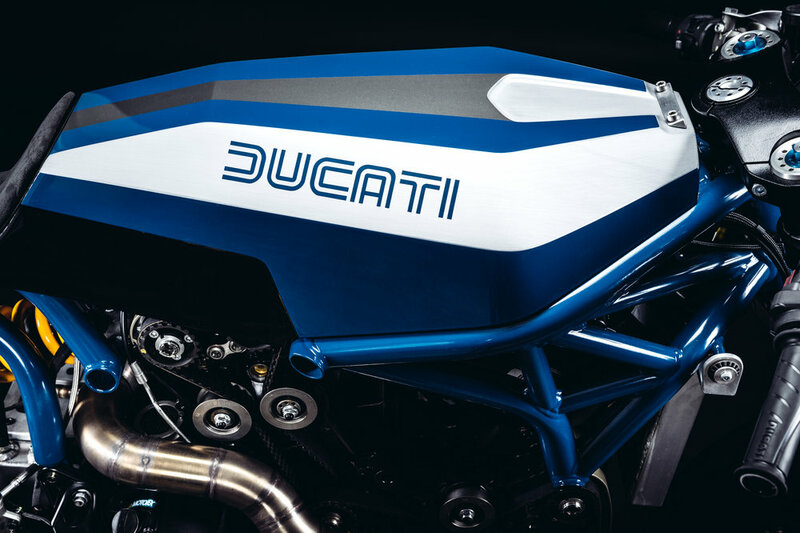 It started off as a stock Ducati and ended up being… The Ducati Pandora. Based on a 2016 monster 1200 r our own vision of a modern racer became reality. 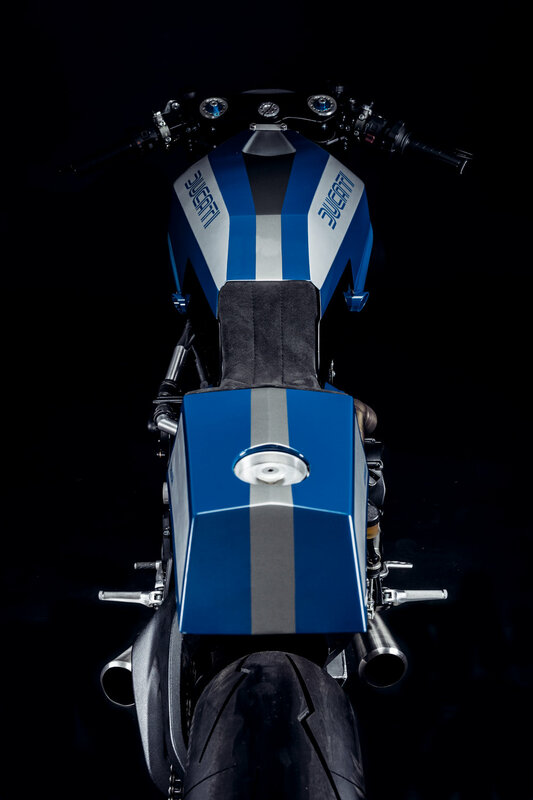 The Pandora is hybrid between a GP-bike and a contemporary Cafe Racer. Inspired by the classic sport bikes from the 70’s such as the 900ss and 750 sport we wanted to keep the classic lines of that era but still give it a modern look. After building the rear frame we took on the seat and the tank. We had the idea of building the seat and tank out of one piece. We started with making an aluminium construction to put clay on it to shape the monocoque. A friend then made a mold and the final fiberglass monocoque. In order to keep low and clean lines the fuel tank was moved to back. The fuel cap and a 2.5 liter aluminium tank are in the rear while the main tank sits where the battery box and lots of electrical things previously were. Combined the two aluminium tanks fit more than enough gas to get you places. 9 liters of gas to be exact. Where one would expect the fuel tank we now put the brain of the motorbike: everything from the abs to batteries we hid under there. Also we used a custom-made cooler that is half the size of the original one yet more efficient. We replaced the rubber hoses with aluminium pipes to fit the radical appearance of the bike. The exhaust work was done in-house and replaced the original 2-in-1 system. The megaphones are metal pressed out of a flat sheet on the leith. The handlebars we replaced with clip-ons. If your dream of a modern, yet classic race bike is similar to ours, we got good news for you: The bike is up for sale, if you’re seriously interested in owning this beauty get in touch with us.